Elements of Gothic architecture – such as Gothic rib-vaulted ceilings or naturalistic decorative stonework – gradually reached our territory from the end of the 12th century due to contact with the French environment. At first these elements appeared only sporadically or in combination with the Romanesque style of country churches, town houses or on the structures of Franciscan and Cistercian mendicant orders. Prospering mining towns and Spiš towns were mostly open to new styles. 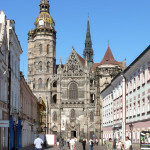 A characteristic feature of Gothic architecture in Slovakia is the diversity of French, German, Austrian and Bohemian impulses and influences that were turned into unique regional shapes by local builders. The most remarkable monument of Gothic architecture and its later interpretations through the Hungarian science of art and preservation of monuments in the 19th century is a parish church in Košice – St. Elisabeth‘s Cathedral. Its construction began either in the 1480s or the 1490s and continued in three phases till the 1570s. Its foundations were laid on three basilican naves with a transept and a pair of diagonal chapels, a deep apse, and with two towers on western facade. The second phase could be considered the most valuable. It was inspired by the influence of Peter Parler’s Prague School and the Viennese architecture guild. This phase included the vaulting of naves and the construction of a unique double spiral staircase made of stone and leading up to the royal matroneum – a gallery. The third phase of construction is connected to a local builder – Master Stephen from Košice – who brought Viennese features into its construction. At the end of the 19th century, the cathedral became the object of Hungarian researchers and protectors of monuments. They initiated its idealistic reconstruction – the last phase – which was finished in 1896. Influences of Viennese architecture, or rather of its chief masters involved in the construction of St. Stephen’s Cathedral in Vienna can be also found in other significant works of Gothic architecture in the Slovak territory. Proof of this influence is e.g. rounded rib vaults. Since the constructions of big sacral buildings lasted for several centuries, many prominent builders could apply their knowledge to them. The vaulted ceiling of St. Martin’s Cathedral in Bratislava is credited to three chief masters of the Viennese guild. The oldest part – the vault of the three-nave hall-like space – was designed by Hans Puchsbaum (born before 1390, died in 1454). Another part of the cathedral – a new sanctuary with a star-ribbed vault – was finished in the 1580s according to a proposal of Puchsbaum’s successor in the Viennese guild – Lorenz Spenning (born between 1400 – 1410, died in 1477). The latest proof of Viennese influence is represented by the Chapel of Metercia situated in the northern part of the church and the cathedral’s southern hallway. One of the authors was another master of the Viennese guild, the eminent sculptor and architect of medieval Central Europe – Anton Pilgram (1460 – 1515). This gathering of extraordinary artists is the reason why St. Martin’s Cathedral in Bratislava is not only a work of supreme artistic value, but also important proof of the good taste and cultural orientation of the local builders. In the same period (16th century) Anton Pilgram or his co-workers left behind their works in two mining towns too – in Banská Štiavnica and Banská Bystrica. In the Church of the Virgin Mary of the Snow in Banská Štiavnica, Pilgram’s authorship is indicated by the similarity of his drawings of the rounded vault of the sanctuary. His drawings are still preserved in Vienna and date back to the same period when the vault was constructed. In the Virgin Mary’s Assumption Church in Banská Bystrica, Pilgram’s influence is even more provable. Not only is the vault of the oratory with double-curved ribs built after 1510 almost identical to the vault in the St. Stephen’s Cathedral in Vienna designed by Pilgram, but even the coat of arms on the corbel in the sacristy bears Pilgram’s signature. Whether or not these vaults were the works of Pilgram or of his co-workers, the fact is that the above mentioned church in Banská Bystrica is one of the supreme works of Gothic architecture art not just in Slovakia. When we talk about medieval architecture we have to mention the cult of the dead that prompted the construction of many remarkable works and gave rise to new building types – ossuaries, cemetery chapels and double chapels. These buildings were intended for burial services, but also for the storing of the remains of the deceased or of holy relics. In this context, the most remarkable of them are the double chapels inspired by the chapel of French kings – the Sainte-Chapelle – built to house the relics of Christ’s Crown of Thorns. 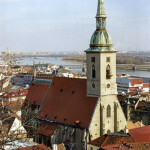 The oldest chapel in Slovakia built under this influence after 1362 is located in the Franciscan church of the Annunciation of the Lord in Bratislava. The St. John the Baptist Chapel within the church did not however serve for burial purposes, but probably for liturgical purposes. Similar in form, but for a more obvious purpose two notable double chapels were built in the Spiš region in the second half of the 15th century. The first of them – the Chapel of the Assumption of Virgin Mary in Spišský Štvrtok – is the masterpiece of the Viennese master Hans Puchsbaum and one of his co-workers. This masterpiece is not just a top-notch documentation of the Viennese guild influence in the Spiš region, but also a remarkable transformation of distant French style in terms of visual arts. The counterpart to this little architectonic? perfection is only few kilometres away – Zapolsky Family Chapel built in Spišská Kapitula in 1497. It was also based on the above mentioned chapel. Apart from supreme works of Gothic architecture built in the centres of the then Upper Hungary, the features of this spectacular style in vernacular architecture are also worth mentioning. The most notable examples of such half-vernacular half-sacred architecture are still preserved in the northeast Slovakia in the Gemer region and in the Spiš region. Church of the Holy Spirit in the village Žehra built at the end of the 13th century and the Church of the Annunciation of the Virgin Mary in Chyžné built at the beginning of the 14th century are the most impressive examples.